With Uber backing several potential urban flyers, other investors are moving to invest in longer-range craft with smaller, but more exclusive markets. 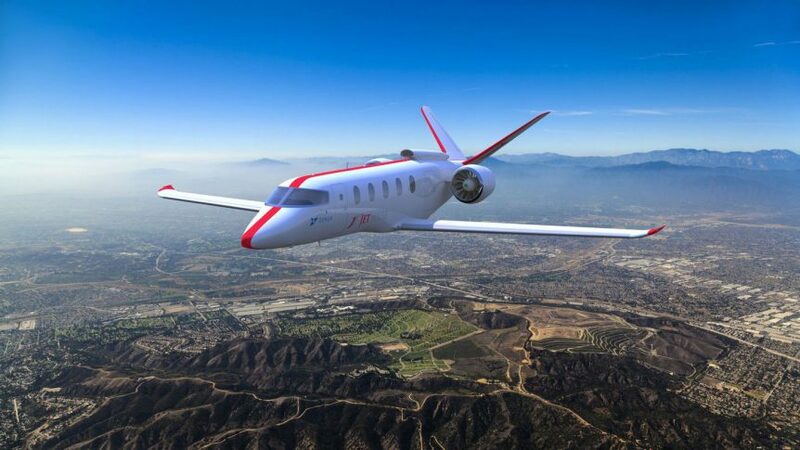 With funding from Boeing’s Horizon X and Jet Blue Technology Ventures, and Washington State’s Clean Energy Fund, Zunum Aero’s initial batch of hybrid electric aircraft will fly in the livery of JetSuite, a private aviation company that’s a partner of JetBlue Airways. Members and customers can find scheduled flights within JetSuiteX’s California and Arizona operating range. Prices are similar to business class accommodations on Southwest or Alaska airlines. It will be interesting to see if lower operating costs for Zunum’s regional hybrids pencil out in customer’s favor. For example, Zunum says, ”A Seattle-to-Whistler flight could cost $79 and take only an hour and a half in door-to-door travel time. For comparison, the one-train-per-day Amtrak train voyage would cost just over $90 and take nine hours, 15 minutes(!). Seattle-to-Portland could take a couple of hours door-to-door, based on the use of regional airports.” Looking up drive times for similar road trips means at least a four-hour run to Whistler and a three-hour drive to Portland, not counting frequent traffic jams and impediments like bridge closings or border crossings. JetSuite seems to be serious about adding these craft to its fleet, announcing plans to buy 100 of Zunum’s planes. Given JetSuite’s business model of providing exclusive transportation to a nation-wide network of airports for its members, private charters can transport executives and their staffs. Perhaps even more exclusive, but offering even greater flexibility and similar economy of operation, XTI’s TriFan 600 can dispense with the ride to the airport. 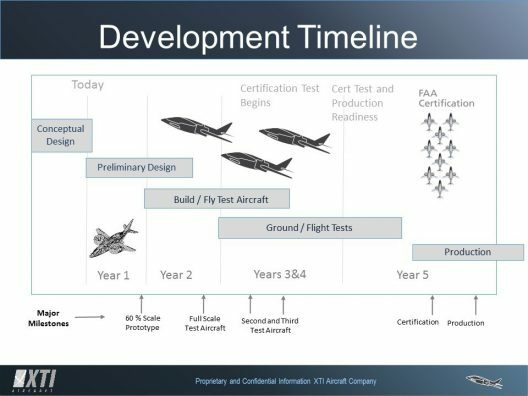 Thomas Walker, Business Development and Sales Consultant for XTI Aircraft, recently gave your editor a brochure extolling the virtues of this hybrid electric VTOL business aircraft. The 3,500 pound empty weight, single-pilot, five passenger machine can fly from existing helipads, or at a heavier gross weight, from conventional runways. The $6.5 million machine, with a relatively low claimed operating cost of $350 per hour, can save its owners $1 million per year if the owner flies the TriFan 1,000 hours, according to the company. 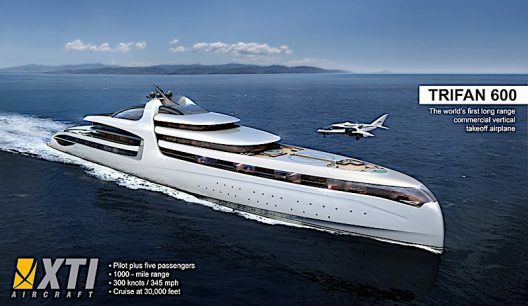 One hour could take the passengers 340 miles at an operating cost per passenger of $70. 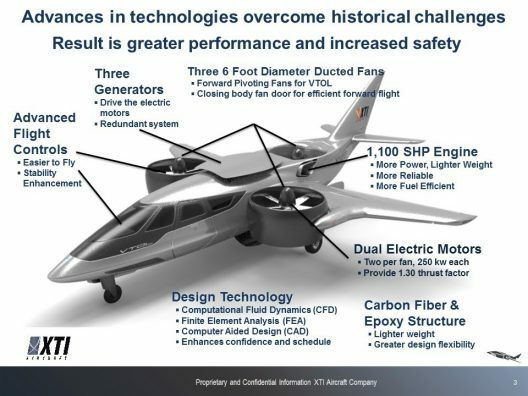 XTI compares these costs to those for other VTOL aircraft with comparable range – 660 miles with an 1,800-pound payload and cruising at 270 knots (310 mph). Using its conventional takeoff and landing (CTOL) capabilities, the airplane is projected to carry a payload of 2,800 pounds 1,200 miles. The craft can reach its maximum cruise altitude of 29,000 feet in only 11 minutes. Robert LaBelle, XTI’s CEO, explains the capabilities of this unique aircraft. A product of eXtended Technology and Innovation (hence the company’s name) the TriFan has three ducted fans powered by two 260 kilowatt motors each. These are motivated by a single 750-kilowatt (1,000 horsepower) turbine driving three generators. XTI is looking at engines such as the Honeywell HTS900. “The turboshaft engines will be connected to three generators powering six electric motors, two for each of the Trifan’s three ducted fans. Takeoff power will come from onboard battery packs. Bye said the batteries can handle the task as the takeoff phase is brief before the two wing-mounted ducted fans rotate forward to cruise flight position and turboshaft power takes over for cruise flight. XTI reports sales of 60 TriFans, with a significant number sold at the Ft. Lauderdale International Boat Show last November. With low operating costs, charter services may consider TriFan’s as next-level commuters, hauling more passengers over longer distances than they urban equivalents. Quiet operation and redundant safety protocols will make these more than acceptable transportation devices in a range of urban environments.